Glenn Irwin is third in the MCE British Superbike Championship after the first six rounds. MCE British Superbike title contender Glenn Irwin says his minimum target is a brace of rostrum finishes this weekend at Thruxton. The PBM Be Wiser Ducati rider was nursing an arm injury at Britain’s fastest circuit last season following a crash at Knockhill in Scotland, and is confident he can show his full potential on Sunday as he bids to narrow the championship gap to JG Speedfit Kawasaki's Leon Haslam. Carrick's Andrew Irwin has been making excellent progress as a rookie in the MCE British Superbike Championship. The Carrick man clinched his maiden BSB podium at Thruxton in 2016 and after twice finishing as the runner-up at Brands Hatch last time out behind Josh Brookes, Irwin feels he is knocking on the door of his first win of the season. He said: “I was still carrying an injury for the meeting last year so returning to Thruxton 100 per cent fit since my first BSB podium in 2016 is something I’m really looking forward to. “I’m looking to grab a brace of podiums at least this weekend to narrow the gap to the championship lead, which is our ultimate goal. Three-time British champion Keith Farmer is leading the Pirelli National Superstock 1000 Championship for the Tyco BMW team. Irwin moved up to third in the championship standings following round six of the series at Brands and is firmly in contention to reach the Showdown for the first time. 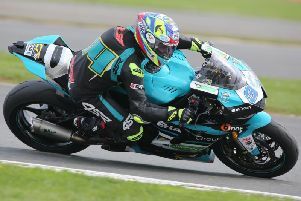 His younger brother Andrew, who was brought into the team as a replacement for the injured Shane Byrne, has been hugely impressive as the 23-year-old continues to make strides as a BSB rookie. He finished ninth and 12th at Brands Hatch and is once again setting his sights on the top ten this weekend at the unique Hampshire circuit. “Thruxton is a track that I always enjoy going to, it’s like no other and we don’t get to test or ride at it too often so it levels everything out, which gives me a better chance,” he said. “I go there with the same goal, which is to be back inside the top ten in both races and continue my BSB learning process. Tyco BMW’s Michael Laverty is hoping for a more productive weekend after a frustrating time at Brands, where he finished 10th and 11th. The Toome man missed FP3 with a technical issue and qualified down in 13th place, but Laverty – who is ninth in the championship, ten points behind team-mate Christian Iddon and 33 points outside the Showdown places – is more hopeful for Thruxton. “I had a much better feeling with the bike for race two following a few set-up changes between the races (at Brands),” he said. Clogher’s Keith Farmer will be out to stretch his lead in the Pirelli National Superstock 1000 Championship for the Moneymore team. The three-time British champion leads Joe Collier by 13 points, with Billy McConnell only four points further adrift in third in a tight title battle. Free practice commences on Friday, with qualifying scheduled on Saturday from 4pm. On Sunday, race one is due at 1:30pm with the second BSB race at 4:30pm.